The plow cuts under, then lifts, turns and breaks up the soil to prepare it for planting. This is a sturdy, all steel, walking plow, which was pulled by horses. The steel plow was invented in 1837 by John Deere. By the 1870s larger plows with more blades and which were ridden became common. The plow is the first basic tillage tool. A field needs to be prepared for planting. It starts as land upon which has been growing either native plants for new plots, of the remnants of the last crop in established farms. The soil is often dry and hard after a hot summer or wet after winter rains. The plow consists of a bladelike plowshare that cuts into the soil to begin to prepare it for planting. As it cuts a furrow, lifts it up, turns over, and breaks up the soil. This also buries the vegetation which was on the surface and exposes soil which can now be prepared for planting a new crop. Plows were initially wood, often little more than a forked stick. Later metal tips were added to the wood to allow it to last a little longer. The wood plow began to be replaced by iron in the 1820s. The iron lasted even longer with far less maintenance. 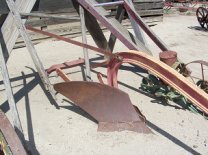 By the 1840s the cast iron plow was being used on the majority of farms. In1837 by the all steel plow invented John Deere. The steel plow shed the soil better than a cast iron plow and had less of a tendency to break when it hit a rock. The plow here is an all steel plow. In the 1870s a successful riding plow, called a sulky plow, was developed. This replaced the walking plow as the farmer had better control on the blades and it was less work for him to ride instead of walk. Soon 2 and 3 blade sulky plows were developed. The more plow blades, the faster a field could be plowed. By the 1930s tractor pulled plows replaced the horses and disks replaced the plow blades. The tractors worked faster, as they could pull larger plows, more blades, at a faster speed. Unfortunately, the constant turning and breaking up of the soil allowed for soil erosion by the wind and rain. In the 1960s minimum tillage and no-tillage farming became more popular and the plows use became less popular. 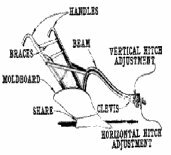 The share (or landslide) is the pointed lower part of the plow. Its height should approach the depth of the furrows, from 4 to 8 inches. As it digs into the soil it receives the most wear and needs to be replaces sooner than the moldboard. Its configuration can control the plow tendency to dig into the ground. The moldboard is the large curved pate in the back. It lifts, turns and pulverizes the furrow slice. Different shapes work better for different types of soil. The share is metal plate on the other side of the landslide. It supports the landslide. The beam attaches the plow to the horse. It was initially made of wood and later of steel. The bracket with a series of holes is where the team is attached as shown below. The heavy-line horse is hitched correctly. The dotted line shows the same horse with the hitch raised to accommodate a short hitch. If the dotted-line horse were hitched the same as the heavy-line horse, an up-pull in the beam would result. Tugs that are too long have the opposite effect. Raising or lowering the clevis corrects the line of draft from the hame to the point of draft. One or two horses pulled a single plow. Three horses were required for a sulky plow and four to five horses were needed for a gang plow.